While many people think of other special days like Valentine’s Day or anniversaries when they think of romance, I think of Christmas! I imagine the glistening snow that falls peacefully from the sky, horse drawn carriage rides, twinkling Christmas lights, and cozy winter nights cuddled up on the couch. 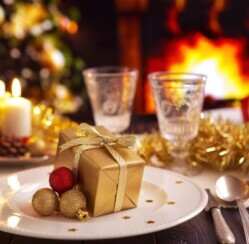 In my opinion, there is just no better time than now to offer romantic Christmas gifts to your special someone. The most wonderful thing about romantic Christmas gifts is that they don’t have to be expensive or elaborate. They simply have to come from the heart. They just need to be thoughtful gifts that demonstrate your love and affection for your one and only. If you are thinking about warming up the car, digging for your keys, gathering up the kids and braving the winter wind to head out to that big box store across town in search of romantic Christmas gifts, just stop right there! First of all, that toaster on aisle nine is NOT going to win you any brownie points this holiday season, and that ice scraper on aisle thirty might be a necessity, but it isn’t exactly romantic. If you want to discover romantic Christmas gifts that are certain to touch her heart this year, follow me and I’ll show you the way. Have you considered a basket full of gourmet gifts that are certain to tantalize her taste buds this Christmas? 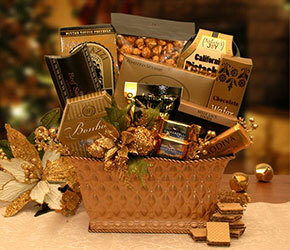 This Golden Gatherings Holiday Gift Basket from Jackie’s Baskets is sure to do the trick. Overflowing with an assortment of fantastic holiday treats that are both salty and sweet, this elegant basket is almost too beautiful to eat! Create a magnificent staycation this holiday season and enjoy an exotic dinner at home from Destination Dinners. 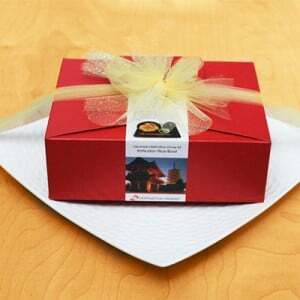 A creative gift that is almost certain to stir up some romance, this wondrous dinner kit includes the nonperishable ingredients and a shopping guide to help you prepare a fabulous dinner based on the exotic location that you select. Not only will you and your loved one get to enjoy mouthwatering cuisine, but you will receive an informative insert that includes interesting information about the history and origin of the dinner you select. Why not set the scene for a romantic evening watching her favorite movie? The Pick a Flick gift from Movie Noodle is a wonderful way to start the show. Featuring popcorn, movie theater candy, soda, and your choice of movies, this fantastic gift is the symbol of romance this Christmas. The Black Hills Gold Silver CZ Ring is a magnificent way to show that fabulous lady in your life how much you care. 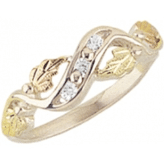 With 3 dazzling cubic zirconias wrapped in beautifully designed leaves, this elegant ring will have her holding the mistletoe over your head in no time. Which holidays do you think are most romantic?